← Adam’s Restaurant – Is Birmingham Seeing Michelin Stars? 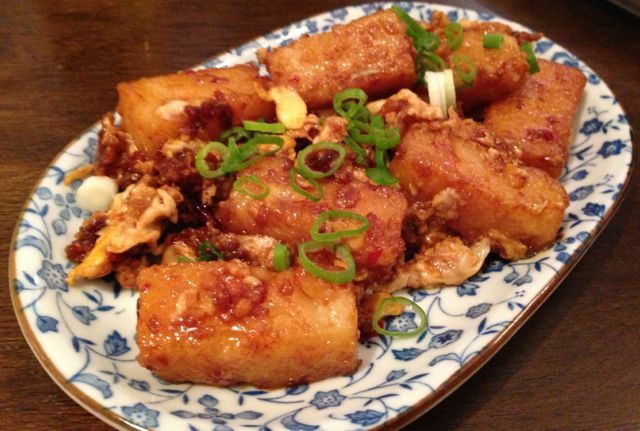 South-East Asian flavours are hard to be found in Birmingham’s culinary scene – sure there are plenty of Chinese restaurants (some worse than others), and a couple of Thai joints that are passable, but that’s about it. 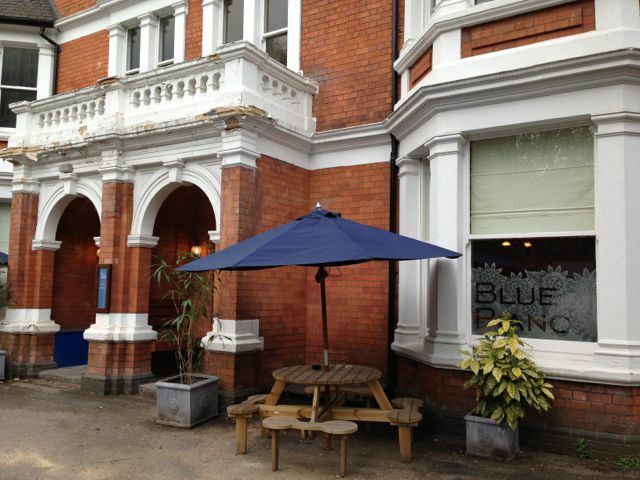 So enter The Blue Piano, nestled on a side street just off Five Ways, specialising in Singaporean, Cambodian, and Malaysian flavours. A converted Georgian townhouse houses the family restaurant on Harborne Road. It really doesn’t jump out at you even if you’re looking for it and when you do find it you may worry, as we did, that the faded glory of the crumbling plasterwork reflects what’s to come inside. Not so, although my top tip to the restaurant is get the frontage sorted, it will put people off! We were greeted by a glorious Minton floor on entry, and a very warm welcome. There is a comfortable bar and while we were there a pianist was playing the eponymous Blue Piano whilst accompanied by a double bassist. It was a nice touch and set a relaxed tone. As we were hungry we went straight through to the colonial influenced dining room to get started. I can’t say I’m familiar with the food from this area of the world, so it was useful to have on hand a knowledgeable waitress. For starters we tried the special, a chicken and prawn dim sum, a dish called “Top Hats”, and Singapore “Carrot Cake”. I loved the savoury carrot cake which is not cake-like at all, it’s made from rice flour and mooli – it was sticky, sweet, spicy, and most importantly, delicious. 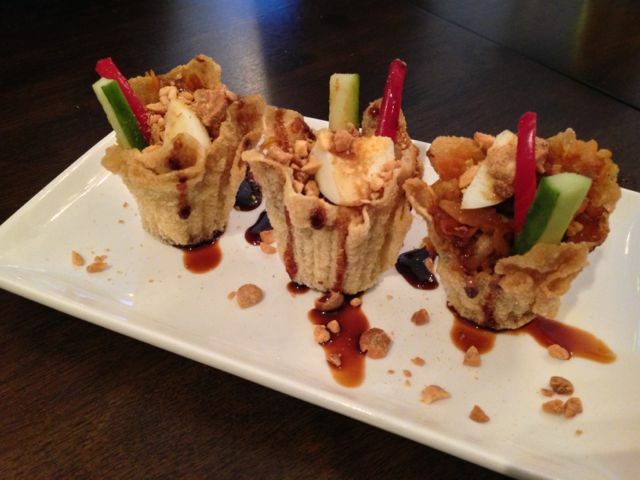 We also loved the “Top Hats”, wonton pastry cups filled with spiced vegetables, with boiled egg and peanuts on top. An unusual and tasty starter which was great to share. We were drinking Kirin Ichiban beer for most of the evening which is a good match for Asian food. There is of course a selection of wines available (they run a wine tasting course), as well as a cocktail list. We can recommend the Singapore Sling. I ordered the Beef Rendang as my main dish, it’s a dish of beef slowly cooked in coconut milk and spices. The beef was succulent and sweet and very flavoursome. I wasn’t keen on the side dish of Kang Kong leaves which had been stir fried and were overly greasy. The jasmine steamed rice we had was super. The presentation of the Rendang needs some work in my opinion – the best curry can look like slop when served on a plate, it should be in a bowl which is then placed on the plate. The other main was beef fillet cubes on a lemon grass skewer, served medium-rare with a pepper sauce and lotus root crisps. There wasn’t a bite left which is proof enough that it was good. Two of our party tried dessert, which I think always tend to be a bit random in Asian style restaurants. Sure enough they had a chocolate brownie and a slice of orange drizzle cake, which they tell me were good. I’ll take their word for it. To the rear of the restaurant is a fairly big garden with seating which will be wonderful in the summer for an evening pint of Kirin Ichiban and some dim sum. 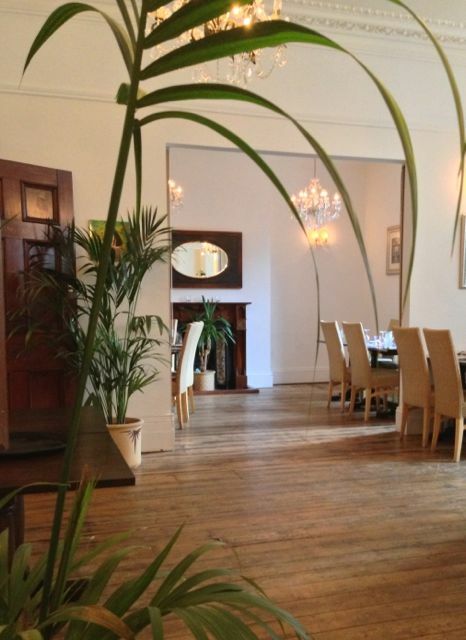 The restaurant also offers a room for private dining, and a takeaway and delivery service. We will be back to have some other of the dishes on the menu that also sound delicious. Do try and get past the poor kerb appeal, it’s good value tasty food, and you should definitely give it a go. 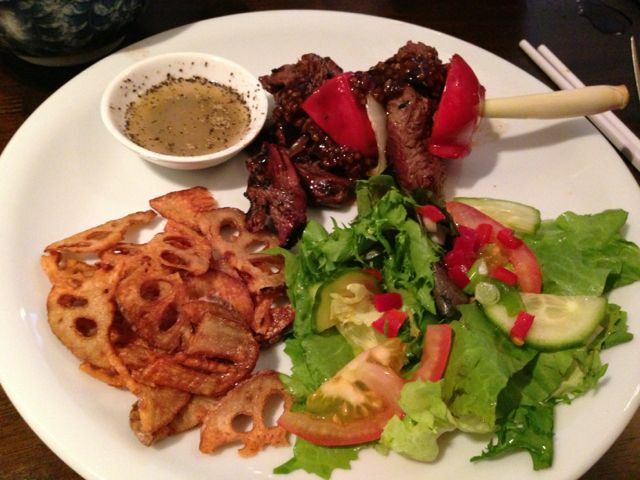 This entry was posted in Area: Hagley Road, Cuisine: South East Asian, Price: Average, Price: Cheap as Chips - Inexpensive, Venue type: Restaurant and tagged Birmingham Cambodian Restaurant, Birmingham Restaurant, birmingham restaurant review, birmingham review, Birmingham Singaporean Restaurant, Birmingham South East Asian Restaurant, Out In Birmingham, out in brum, OutInBrum, restaurant review, Where To Go In Birmingham. Bookmark the permalink.